I really enjoy making figures, but I particularly enjoy making figures that are completely unplanned. 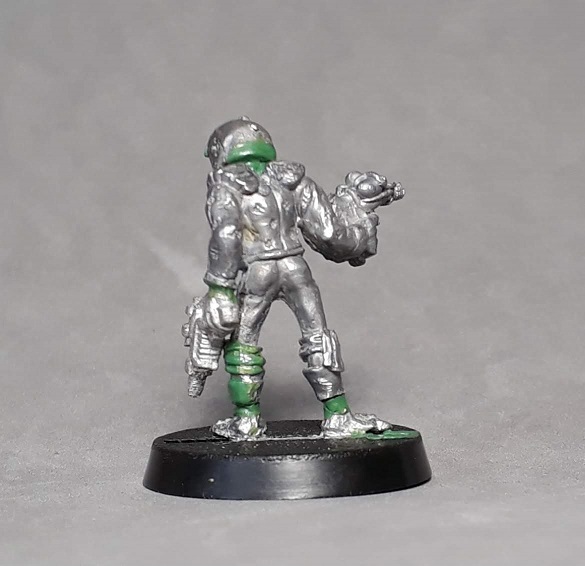 A week or so back, Jason Fulford, keeper of the excellent Rogue Heresy blog sent me some junk Rogue Trader and Judge Dredd figures. The figures had clearly been donors for other conversion projects and were variously headless or weaponless - perfect conversion fodder. I envisage Hornby Toad (name courtesy of cheetor) as a rather unpleasant, miserable mutant - perhaps he has a pervading swampy odour and questionable morals. Nevertheless, he's yet another Search/Destroy agent scrapping to make some money and stay alive in the bounty hunting game. Star Lane Space Pirates at one of their strongholds. I went for a range of blues for Hornby, with a pale greenish skin. It's not often I go for a colour scheme with such a limited number of colours, and it was fun to make all of the blues work alongside each other. Hopefully he'll see action with (or against) Johnny Alpha in some games soon! I don't know how you push it further with each conversion, but you manage to. I'm in awe. 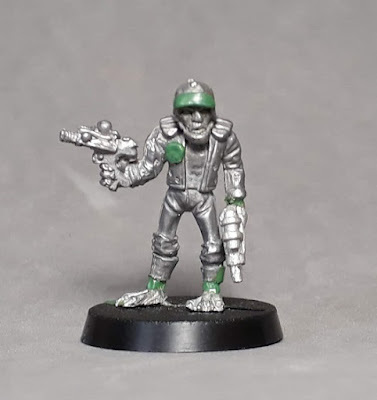 Can't wait to see him on the table. Another great conversion bringing broken or incomplete figures back or using them in conversions is a worthy activity in and of itself never mind how cool your's are. Very inspiring, as always - the 2000 AD range is where many of my own recent custom jobs have come from. For me it all started when a slightly older friend was cleaning out his collection to sell on Ebay, and I was handed a Riot Judge with a squashed head and asked if I could make something out of it. Those riot judges are great figures too! They're neutral enough to have potential in a huge variety of settings. The Dredd minis are well worth looking at. OK, some of them are too distinctive, and others are a little odd looking or have exaggerated features. But many of them are ripe for repurposing as RT scum or civilians. Simple but effective I think! Thanks very much. You know it's right when you could swear you saw the character in the comics. That is very nicely done. He reminds me of Puddleglum from C.S. Lewis' 'The Silver Chair'! Ha ha yes! For me it was the combination of the expression on his face, the skin colour and the feet that did it! I can't think of anyone better suited than you to get a gift of some unloved 80s miniature parts. Great combination of parts, as always. The limited palette is a great way to give that old four colour, 1980s print finish that I associate with classic 2000AD. Saw this on facebook, another fun conversion. I've only tried to limit my palette once. It was interesting. Thanks Sean. 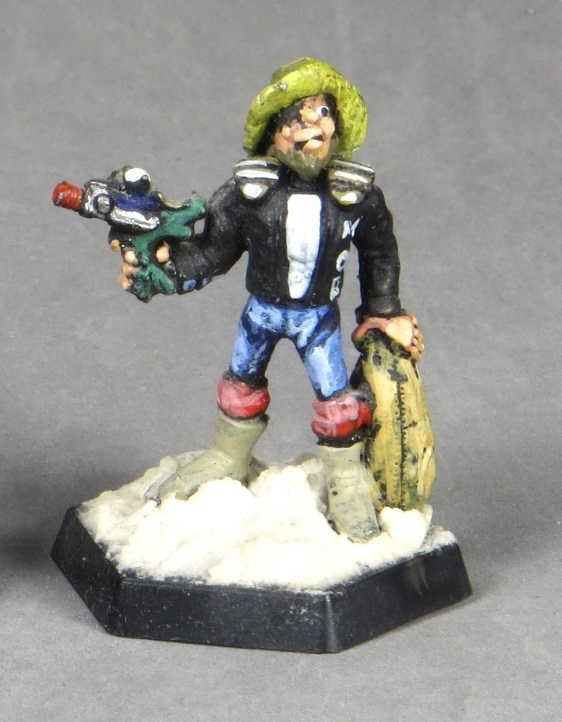 Funnily enough, I painted this guy in a terracotta suit to start with and it looked awful. Switching it to blue just suddenly made the colour scheme work. Proof that sometimes less is more when it comes to conversions. Good work from sculpting to final paint job. Sometimes the simple, easy conversions are most satisfying. Thanks!